I attended my first craft show for the 2009 season on Sunday, March 29th. The show started at 9 so I had to be at the Fire Company to set up at 6:30 am. The show was very well organized. There were tons of Fireman there to help you find your space and unpack your vehicle. The food was delicious. The other vendors were very helpful and friendly. Everyone was there to have a good time. I sold a bunch of stuff (14 bags) so be on the look out for new bags. I have another show on Saturday, April 4 so I am hoping to get a bunch of stuff made this week. Wish me luck and pray for my strength... it's going to be a long week! I came up with this bag over the weekend, but I am unsure of what to name it. I've already carried out and have recieved lots of compliments. I've taken it to work and the ladies love it. I already have a few orders for it. Now I need your help. I don't know what to name it. Leave me a comment or email me and let me know what you'd name it. You never know, I may like your idea and use it. It's a multi tasker like most of us. It's a tote and a clutch. How great is that??? The handles, although wooden are very comfortable to carry. The size perfect as a small tote and folded in half as a clutch. I can carry my wallet, change purse, cellphone, iPod Touch, and other mom related items comfortably in this. Even with all I have, I can still use as a clutch. Vote now until March 31, 2009. Thank you for your continued support of Myla's Bags! 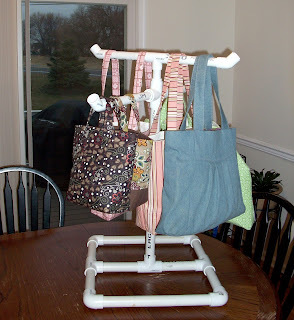 After alot of discussions between my husband and I, I finally decided to make my own bag stand for future craft shows and other events. I am no dummy when it comes to sketching out and idea, although my drawing skills are lacking, my brain can hold tons of precise details on projects and ideas that I get. I headed out to Home Depot late last week and and played around with the PVC piping. I had some idea on what was needed, but had to go out to see if this was true. Anyhow, after only 30 minutes in the store, I checked out, called my husband (because my car was too short to haul 10 feet of PVC pipe) and headed home. After some fitting and measuring, I came up with measurements for how long to cut each pipe. I only glued the bottom portion of the stand so that I am still able to add on to my base if necessary. I am still waiting to paint it. Right know the manufacturer's writing is showing. I have to set up my boxes so that I can spray paint it in the garage without overspray happening... The top pieces are still able to pull apart or be collapsed if I need room in my vehicle. I can't wait until my first show this year on March 29th. I am hoping that everything stands up to the touching and pulling of anxious customers.